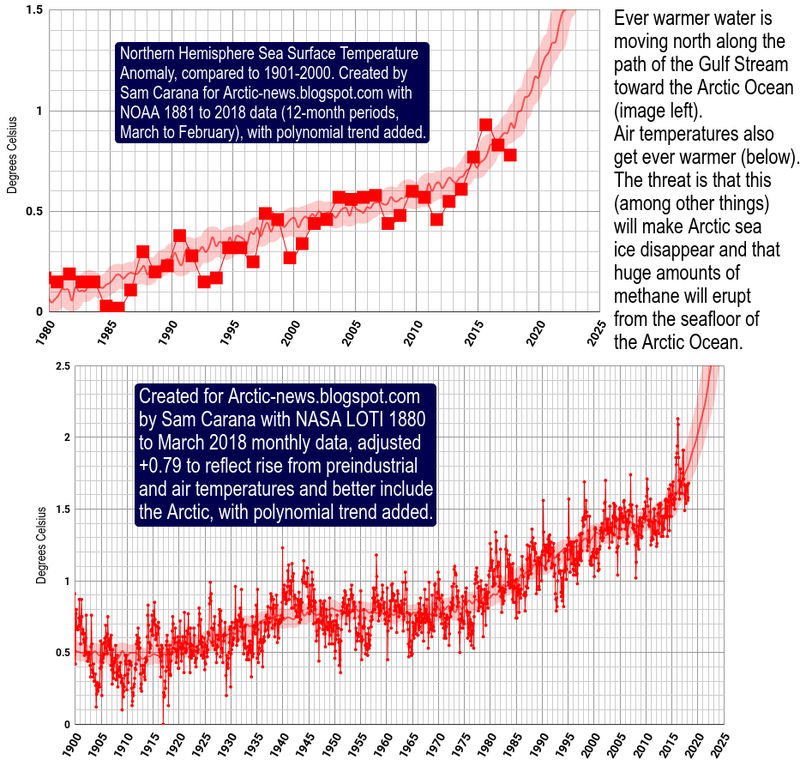 Warming in the Arctic is accelerating. 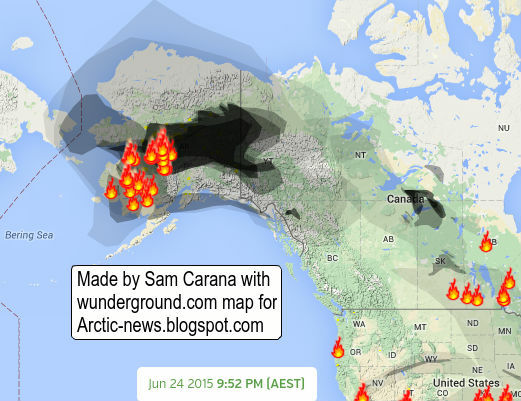 On June 25, 2015, high temperatures hit North America. 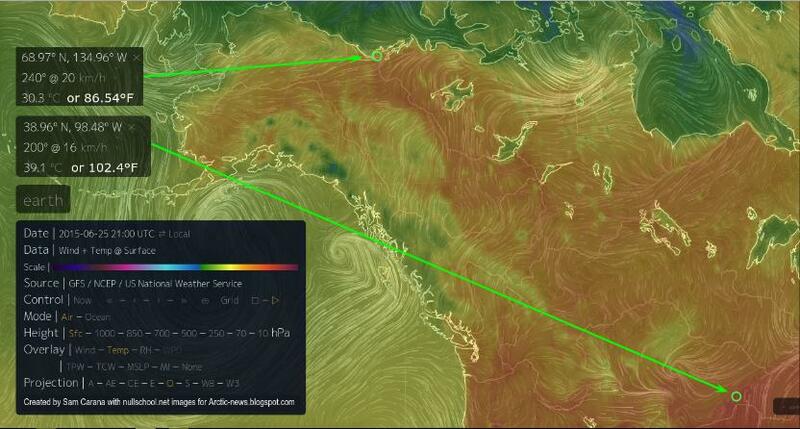 Temperatures as high as 30.3°C (86.54°F) were recorded where the Mackenzie River is flowing into the Arctic Ocean. 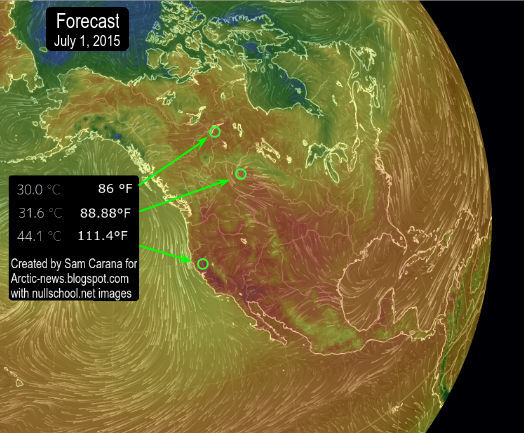 On July 1, 2015, temperatures are forecast to be as high as 111.4°F (or 44.1°C) near Chico, north of San Francisco. 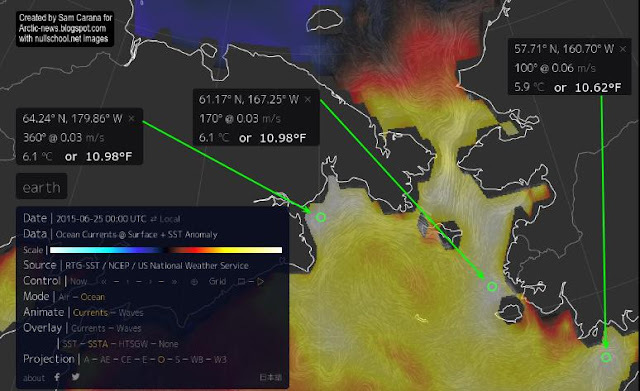 Temperatures are forecast to be high over most of North America and Eastern Siberia, threatening to further warm up waters of the Arctic Ocean. The image below shows that on June 27, 2015, temperatures of well over 40°C (104°F) were recorded in Europe and in Pakistan, where temperatures earlier this month had reached 49°C (120.2°F) in some places. The heat wave reportedly killed 1233 people in Karachi alone. This in addition to the 2500 people killed earlier in India by high temperatures. They are examples of heatwaves that can increasingly extend far to the north, all the way into the Arctic Ocean, speeding up warming of the Arctic Ocean seabed and threatening to unleash huge methane eruptions. They set the scene for wildfires that emit not only greenhouse gases such as carbon dioxide and methane, but also pollutants such as carbon monoxide (that depletes hydroxyl that could otherwise break down methane) and black carbon (that when settling on ice causes it to absorb more sunlight). 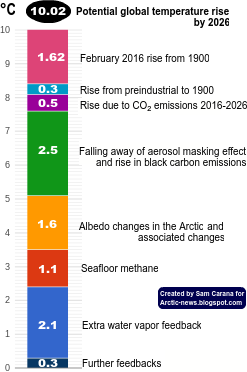 They cause warming of the water of rivers that end up in the Arctic Ocean, thus resulting in additional sea ice decline and warming of the Arctic Ocean seabed. 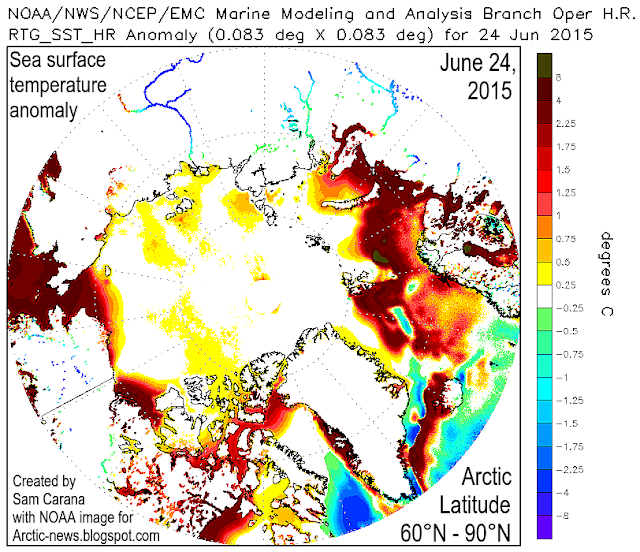 The image below shows increased sea surface temperature anomalies in the Arctic. Note the warming in the area of the Beaufort Sea where the Mackenzie River is flowing into the Arctic Ocean. Very warm water is also flowing from the Pacific Ocean through the Bering Strait into the Arctic Ocean. As the image below shows, the water that is flowing into the Arctic Ocean from the Pacific is much warmer than it used to be, as much as 6.1°C (10.98°F) warmer. As said above, warm water flowing from rivers into the Arctic Ocean is a major contributor to these sea surface temperature anomalies. As also illustrated by the NOAA image below, rivers carrying warm water into the Bering Strait include the Kobuk River, the Naotak River and the Yukon River that flows all the way from British Columbia, Canada, through Alaska and ends in the Bering Strait. 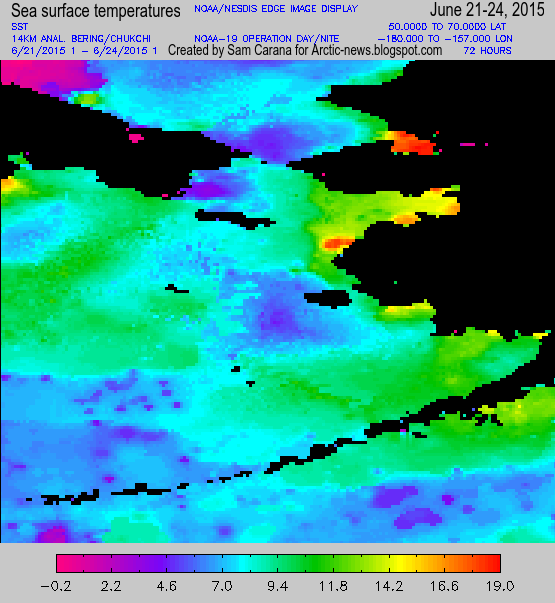 Sea surface temperatures near the coast of Alaska were as high as 19°C (66.2°F) from June 21-24, 2015. 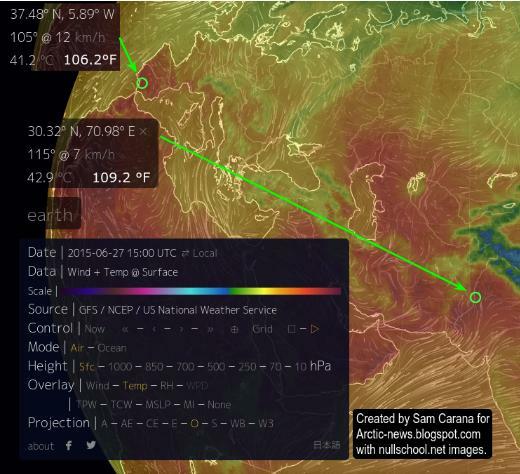 The Naval Research Laboratory animation below shows changes to Arctic sea ice thickness. Sea ice thickness (in m) down to zero where the Mackenzie River flows into the Arctic Ocean and in the Bering Strait where warm water from the Pacific is entering the Arctic Ocean. I was completing my article when yours came out earlier today. I talked about the . "Blob" that's going North through the Bering straight atm and heading to melt more ice. If you don't understand French. you'll probably understand a few pics.http://leclimatoblogue.blogspot.ca/2015/06/un-blob-sattaque-la-glace.html. Pack and leave - before it's too late. Sea ice extent decrease diminished considerably. Is the fifth lowest on record. 10,52 mln km2. fracturing and letting the heat out is this a common event in recent times..